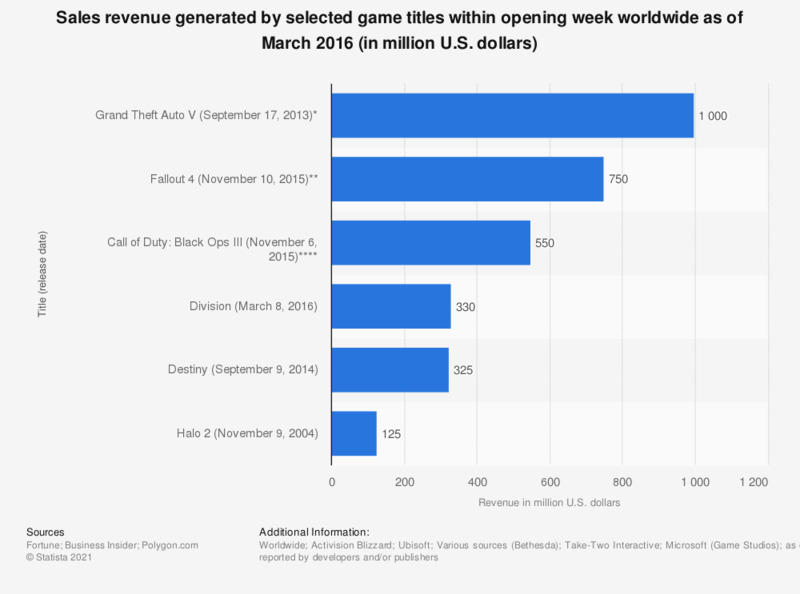 This graph presents information on the sales revenue generated by selected game titles within their opening weeks as of march 2016. Between 2013 and 2016, Grand Theft Auto V, developed by Rockstar, was reported to have generated one billion U.S. dollars in revenue within the first week after launch. In the period of six months, between its release in November 2015 until April 2016, Call of Duty: Black Ops III sold 22.5 million units worldwide. * GTA V figure is based on the first 3 days at retail. ** Fallout 4 sales figure is based on the first 24 hours at retail. *** Call of Duty: Black Ops III sales figure is based on the first 72 hours at retail.